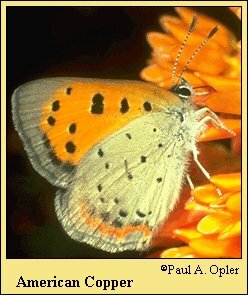 Identification: Upper surface of forewing shiny, fiery orange-red with black spots; hindwing gray with orange-red outer margin. Underside gray; hindwing with submarginal row of orange-red zigzags. Life history: Males perch on grass or weeds to look for females. Eggs are laid singly on host plant stems or leaves. Young caterpillars chew holes in the underside of leaves; older ones make channels in the leaf tissue. Chrysalids overwinter. Flight: One flight from July-September for alpine and arctic populations. Two flights in the north from June-July and August-September; three flights in the south from April-September. Caterpillar hosts: Herbs of the buckwheat (Polygonaceae) family including sheep sorrel (Rumex acetosella), curled dock (Rumex crispus), and Oxyria digyna. Adult food: Nectar from many flowers including common buttercup, white clover, butterflyweed, yarrow, ox-eye daisy, and various composites. Habitat: In disturbed places in the East including pastures, landfills, vacant lots, road edges, old fields; rocky places in alpine habitats, and tundra in the arctic. Range: Nova Scotia south to Georgia, Tennessee, and Arkansas; west across Great Lake states to North Dakota. Native populations found in the Arctic and the western mountains. Comments: Eastern and midwest populations probably result from an introduction from Scandinavia during the colonial period.